I have had a very long week working on putting a database together. My eyes are so blurry! But I really wanted to create tonight, despite my vision. I colored one image, only to determine I don't have a round die large enough to cut it out. So I set it aside and found a different sketch to work with, only when I started getting creative, the sketch went by the wayside! However, I do have an end product to share. I don't think I have ever used so many dies on one card!!! The snowflakes are leftover from a card I posted the other day. They are from a Cat's Pajama's large snowflake die. The background trees are cut out from a line of trees from Impression Obsession. The snow drifts are from MFT and the large tree is from Taylored Expressions. 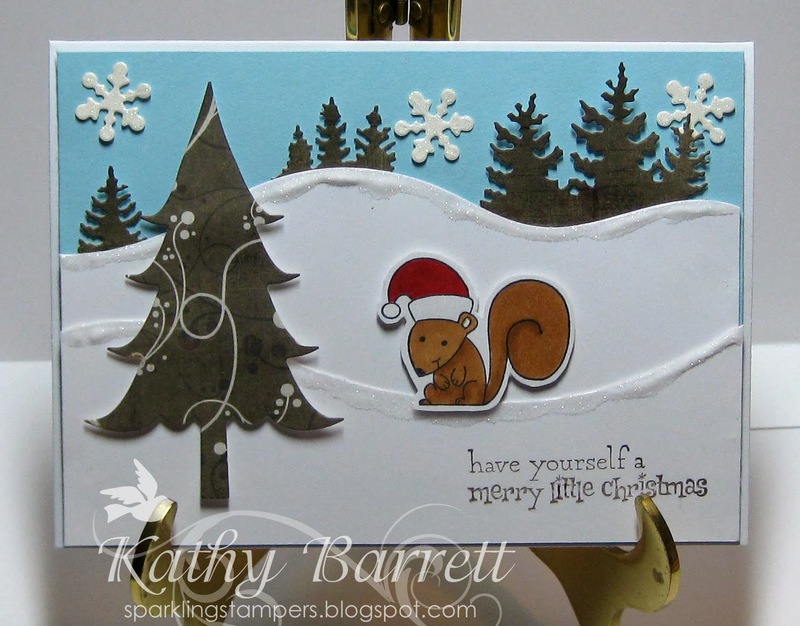 The little squirrel (fussy cut) and sentiment (Versacolor Pinecone) are also from TE. I added Art Institute glitter to the edges of the drifts. All the trees are cut from Basic Grey Wassail, the snowflakes are DCWV glitter paper and the blue sky is from Michaels. I used 3M foam tape for the large tree and squirrel, and to mount the card topper to the base. Such a wonderful and fun little scene you have created here. This card is ABSOLUTELY adorable! I love it!!! So cute. Love the scene you've created. Thank you so much for joining in with our challenge at the ABC Christmas Challenge.